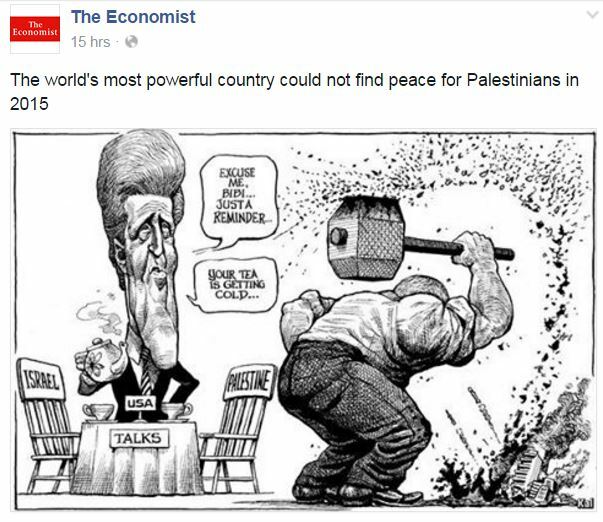 The cartoon was originally published by The Economist in July 2014, during the war between Hamas and Israel. As a friend on Facebook suggested, the cartoon’s goal is not to educate, or to provide a unique insight into the war, but rather to reinforce lazy stereotypes of Israel as a cruel, malicious Goliath inflicting gratuitous violence on innocent victims. It’s especially troubling that a London-based publication which fancies itself a centrist magazine providing “authoritative insight and opinion” would endorse such a facile and extraordinarily misleading graphic commentary. The Economist is as centrist as Hamas and always has been. I guess the British media are all competing with each other who will blacken the face of Israel more. What a bunch of hypocrites and morons. It’s been loony left for ages. Funny cartoon but why did they draw Kerry so realistically? OK, I give up: is this poster a parody or not? Guardian readership is no joke pal. It took me years of reading Harriet Sherwood with tears in my eyes to get to Level 4 and I’m not gonna let some Ziocon ruin my progress now. Level 5 here I come!! UNRWA, misinformation, and EU threats have only prolonged the Palestinian agony and fostered new savageries.. Elementary child psychology would have saved countless lives. The lives of ,three generations of Palestinian Arabs have been curdled and wasted by the misplaced rage directed at the Jews when the real malefactor is the Arab League, And where is the sorrow for the 1948 expulsion of the nearly million North African Jews? All this anti – Israel, anti-Jewish academia suggests to me that we should be more honest and reinstate the old Jewish student quota system. Israel has 37 colleges teaching many programs in English. Learn Arabic. . So the Economist will go back 2 years to explain why the Palestinians are still stateless (because they keep losing their started wars, see) but refuses to acknowledge the peace treaties made by Israel in 2000 and 2008? I count 15 years or 7 years of lost potential stateship for the Palestinian government. If we want to go back further, to the first failed war to remove the Jewish presence from the Middle East, that (strictly Arab) Palestinian state would be 68 years old by now. But, boy, that Economist sure is smart! They could even decipher all the Israeli asskissing done by the Magnificent Mr. Kerry in lieu of his more than obvious general hostility towards Israeli self-defense. An idiotic British Media doesn’t stop the decline of Western civilization. It reinforces and accelerates the decline. Using drawings to tell lies. Bad parenting courtesy the British media. Stereotype or based on a true story? Dishonest POV from self defeating British media whores.